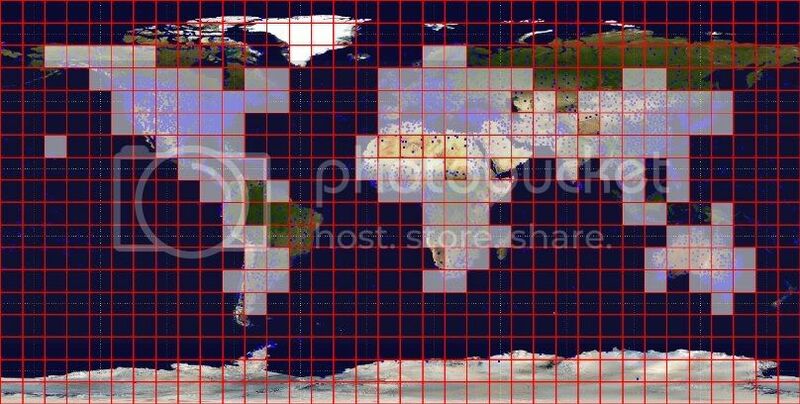 A customizable sized grid can now be drawn over the world map and the grid cells can be colored or contain a text item. Below I have plotted a grid of 30x30 cells. 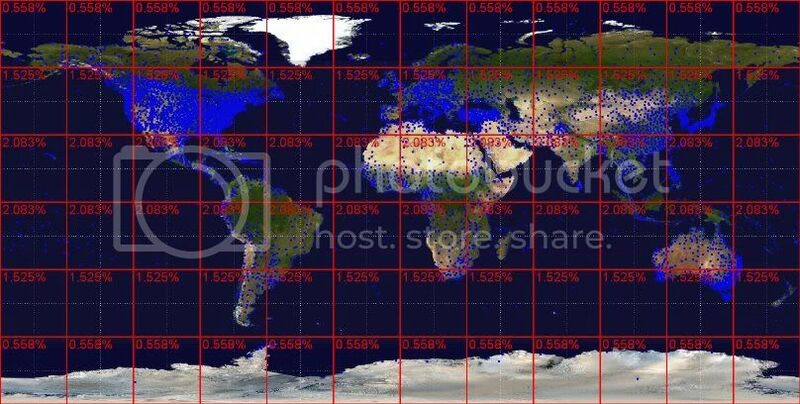 The number inside each is the number of stations in that grid cell. The stations are also plotted as blue dots. The image is quite blurry due to the jpeg compression. In the image below a grid of 10x10 cells is drawn with cells containing more than 10 stations highlighted. Ah, good to see you're progressing. Again, if nothing else, your code is going to win the prize for pretty maps and versatility. Are you planning on just combining the stations within each box, or interpolating like GISS? At first I am planning to just combine the stations within each box. I could try interpolation later. If I try something too complicated I suspect I will make a crucial mistake. Fair enough. Even before that, there's questions on how to handle the duplicate records, and how to combine the stations. Have you been seeing what Tamino is up to? You're working in parallel. I've seen Tamino's work. He is quite a bit more competent at data analysis than me so I am not yet near generating a global record yet. I am currently working on merging duplicate records as you point out. I had implemented something but after testing it yesterday I found a flaw in it. It was a useful waste of several hours though. I will now try something more straight-forward. Hopefully I will have it done today.